Did you think Star Wars the Last Jedi got a little too goofy in some moments? Well, it could have been even goofier if this weird deleted scene from Rian Johnson's film had not bee cut. 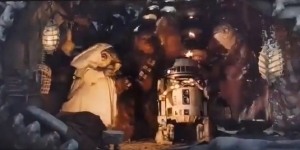 The scene, which is officially called "Rey's third lesson" takes place on Actoo where Luke Skywalker has been hiding out and living the life of a hermit. I personally didn't mind much of the humor in the film as much as some viewers but I'm curious what people think. Check out the deleted scene below. The whole movie was misguided nonsense, akin to the prequels. Unimaginative producers are relying on 3rd rate directors to produce agenda led beige blockbusters. All I want is some decent filmmaking from a 400 million dollar behemoth, not some pissy personal dig at a beloved franchise, that had relit the aesthetic and tone in the first sequel. I did, and it still didn't make that mess any less painful. The prequels were horrible, of course, and "The Phantom Menace" was so bad that it almost single-handedly spawned fan edit culture. So if nothing else, the prequels were at least rewatchable in all the fan edits that attempted to make them more palatable. And they at least FELT like real "Star Wars" movies. I didn't like TFA all that much but was still able to check it out on blu-ray after seeing it in the theater. TLJ is the first SW movie that I have absolutely no interest in seeing a second time. Not because I'm protesting the PC nonsense, not because the whole movie was basically one big troll of its long-term fans. It's just a bad movie that makes so many dumb decisions that you can't even watch it for the set pieces, which are boring. That's the weird thing - that a SW movie, no matter how bad or good, is freaking boring. Nothing is as corny as StarWars Christmas remember that! I saw Last Jedi twice. the first time I was like the above posts but the second time I got it. It works and it's a very good film.